At age 16, Richard Garnett (1835-1906) was appointed an assistant librarian at the British Museum. He established a career for himself there, eventually becoming Keeper of Printed Books. His wide-ranging literary output included a monograph on astrology, the evocative poem ‘Where Corals Lie’ (famously set to music by Edward Elgar), and numerous contributions to the Encyclopaedia Britannica and the Dictionary of National Biography. In his later years, Richard turned to writing the lives of eminent British statesmen, including the National Colonisation Society founder, Edward Gibbon Wakefield. This copy of Garnett’s biography was previously owned by the Dunedin collector Dr Thomas Hocken. 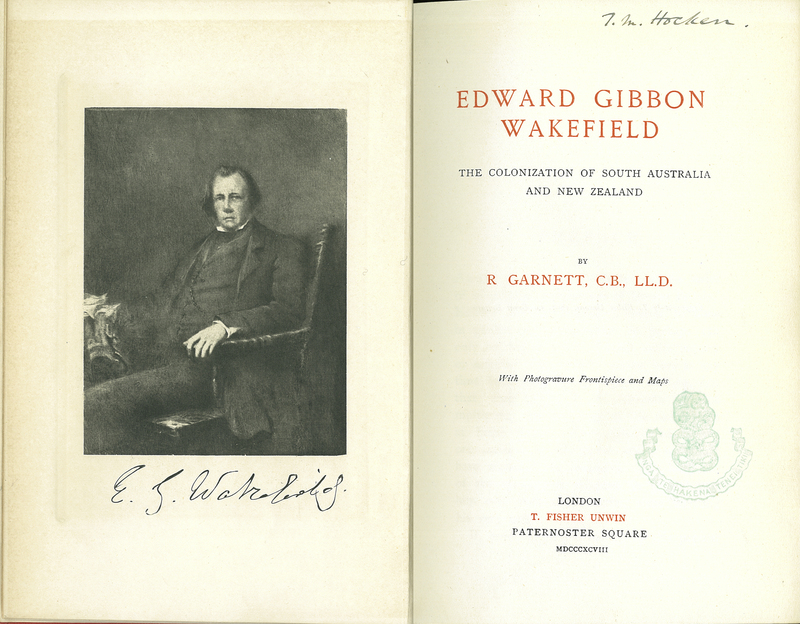 Richard Garnett, “Edward Gibbon Wakefield. The Colonization of South Australia and New Zealand,” ourheritage.ac.nz | OUR Heritage, accessed April 26, 2019, http://ourheritage.ac.nz/items/show/10216.